Independence Day is one of the most important public holidays in Eritrea. One of the world’s youngest independent nations, Eritrea celebrates its independence from Ethiopia on May 24. On this day in 1991, the forces of the European People’s Liberation Front triumphantly entered the country’s capital of Asmara. Eritrea is a small country in the Horn of Africa, bordered by Ethiopia, Sudan, and Djibouti. During the ancient times and the Middle Ages, the territory of what is now Eritrea was part of various African kingdoms such as the Kingdom of D’mt, the Kingdom of Aksum, and Medri Bahri. Unlike some other African territories, Eritrea wasn’t colonized by Europeans up until the late 19th century. Its present-day boundaries were established during the process known as the Scramble of Africa, where European powers occupied, divided and colonized the territory of Africa that hadn’t been colonized yet. As a result of the process, Eritrea became an Italian colony. The first Italian to arrive in the area was a young missionary named Giuseppe Sapeto. Following the political unification of Italy in the 1860s, he convinced the Italian king and minister for foreign affairs that establishing a port in the Red Sea would be a good idea. The first Italian settlements in the area were established in 1882. Eight years later, Eritrea was formally incorporated as an Italian colony. During World War II, Eritrea was occupied by the British army. When Italy surrendered, the former Italian colony was placed under British military administration. After the war, its territory was claimed by the Ethiopian Empire. 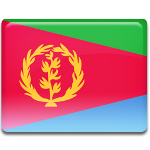 In 1952, Eritrea entered into a federation with Ethiopia, which was formalized by a UN General Assembly Resolution. Many Eritreans, however, wished for independence. This led to the emergence of the Eritrean Liberation Movement in 1958. The movement mainly consisted of students, intellectuals, and urban wage laborers, who were led by Hamid Idris Awate. In response, Emperor Haile Selassie dissolved the Eritrean parliament and illegally annexed Eritrea in 1962. For almost three decades, Eritreans fought for their independence. The Eritrean War of Independence resulted in the deaths of 10 % of the country’s population, but ended in a decisive Eritrean victory. On May 24, 1991, the Eritrean People's Liberation Front liberated the Eritrean capital of Asmara. The anniversary of this event is now celebrated as Eritrea Independence Day, although the independence referendum took place only two years later, and only after that the country’s independence was recognized internationally. Independence Day is one of the most important public holidays in Eritrea, alongside Martyrs’ Day on June 20 and Revolution Day on September 1. It is preceded by a whole week of festivities known as Independence Week. These festivities include street carnivals and performances, parades and patriotic displays, musical concerts, sporting competitions, cycling races, picnics and barbecues, and more. On Independence Day proper, most Eritreans are given a day off from work to celebrate.